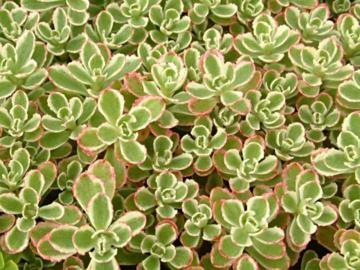 Evergreen or nearly evergreen mat-forming alpine. 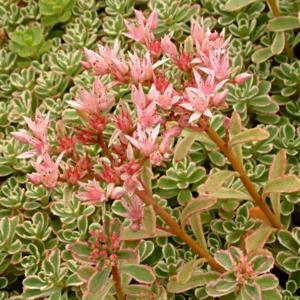 Fleshy, pale green leaves margined with creamy white and distinct pink tinting at the edges. Clusters of small star-shaped pink flowers in late summer. Thrives in harsh, dry sunny conditions. Drought tolerant. Ground cover, rock or alpine gardens, containers.